When we came to know the concept of Bloody Good Book we liked it instantly. It provides a common platform to readers and writers. Writers can submit their manuscript(s) without hesitation. A few chapters would then be made available to the readers to read. Finally, based on the reader’s response, a book is chosen for printing. The project is brain child of Niyati Patel and Rashmi Bansal, who are partnered with Westland Ltd. for book printing. 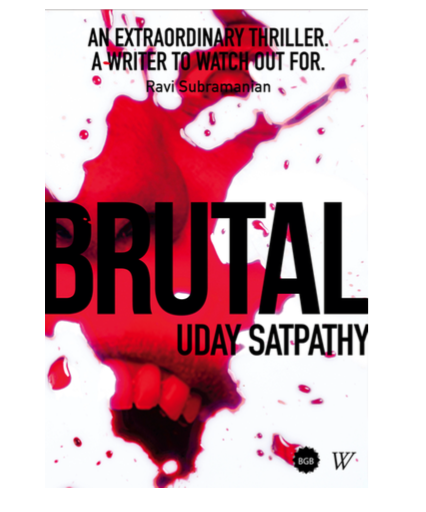 Brutal is the first, to be printed, book in the same context. It would be thus right to say that the book is crowd-curated in a sense. The author – Uday Satpathy – have studied (or better to say, researched) well the arena he have explored in the book. And yes we are not talking about reporter’s world only. The prologue of the book gives you the impression that you are going to explore a horror kind of a story which may have some ghosts and other creatures involved. Also when reading first few chapters of the book, you keep thinking where the “prologue” fits into this? But when you are at the end of the first segment of the book, the things start falling in-place for you. And then with each progressing chapter you are able to join the pieces of a big picture together. It is no doubt a psychological thriller. The references of the drugs, and hallucination are popular since the time of Sherlock Holmes stories by Sir Arthur Conan Doyle. And, you find such references in this book too. Some of the incidents are written very nicely that you feel exploring a scene of a movie or quality TV Serial. Take an example of the scene where a sniper shoots Nitin Tomar. The incident have every little detail mentioned, which you expect in a crime thriller. We wonder though, why there are some offensive words used in the book? No doubt, some of such words and even slang is used in almost all the professions, but we think it would be better to stick to the good content and rather good language. However it works for a lot of readers. The canvas of the book is very large. It tries to cover the shady stuff going on from Underworld to private security firm to a business house to a TV channel to medical world to assassins to the drug world to single parenting to generation gaps to terrorism to children killing massacre to many other arenas. It is quite possible to mess the things up when trying to explore many such worlds and linking their dots. The author however have control in his hand and apart from a few loose ends, he succeed in linking them pretty nicely in the tight manner. To explore any arena in book, one needs to learn some technical terms and jargons associated with it. Uday seems have done his homework well in the same sense. The author have explored the bond of “friendship” nicely. There are various incidents found in the book when you see a character stood by the other only due to his or her feelings, love and respect of genuine friendship (for the other). The author thus is able touch to the emotional cords of a reader by exploring it. This book is “proof-read” well too. We often find that some of the books by very popular author hit the market with some printing mistakes. We didn’t found such errors in this book. The cover page is a combination of red, black and white. You may not find it very attractive, it remains faithful to its name and content though. Prakash and Seema are two journalists both are (now) single and have the inner passion to remain true to their profession. They have earned some good contacts whom they can use as support when needed. They have their bosses to pull the strings at top level when needed. They both sense something bigger going on behind scenes, when covering an incident. Nitin Tomar, a man, going through some troubled situations in his personal life, opened a fire at some school-children which resulted into a massacre. He is definitely a “hated by all” man in the country. He was shot dead when brought to the court of law before his first hearing session. Seema and Prakash without the knowledge of each other, started following their own leads to explore the incidents happened behind the scenes. It gave them opportunity to explore bigger game(s) running behind all these incident; but they have invited a lot of trouble for themselves as well. One of them was kidnapped and other with his friend is now on the hit list of the assassin. Will they be able to uncover the truth, or met with their fate? Soon, Prakash was shaking hands with the new don. ‘Sometimes, write about our gang also’, the kingpin said. ‘It helps our business.’ ‘Absolutely,’ Prakash replied and then bolted from that place. He was a mystery. The more I know him, the lesser I know him. We have all kinds of rules here.Only nobody bothers to follow them. Better leave some things to destiny. “Is there anybody nearby who can help me with the story?” Seema said, ignoring his ‘miserable place’ remark. Every government employee seems to have some complaint. The book have some abusive language and “brutal” events explored at various places, which makes it – parental guidance required – reading material. It is definitely a good choice for the crime thriller lovers. If you like thrillers and crime fictions, you will find all the ingredients cooked nicely in this book. We have had a conversation with Uday Satpathy and it was an interesting session. You can read the full interview here.